“Malignant cells have not completely forgotten how to be healthy; they just need the right cues to guide them back into a healthy growth pattern,” said Venugopalan. 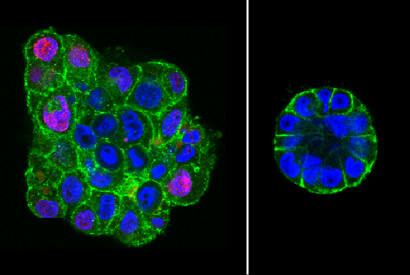 Researchers further added a drug that blocked E-cadherin, a protein that helps cells adhere to their neighbors. When they did this, the malignant cells returned to their disorganized, cancerous appearance, negating the effects of compression and demonstrating the importance of cell-to-cell communication in organized structure formation. The National Institutes of Health helped fund this research through its Physical Science-Oncology program.